Since inception in 2003, FORM has continued to invest in quality over quantity, providing staff with year-round educational opportunities through our FORM University program. Opportunities for designers to flex their creativity are abundant and continue to result in strengthened services. Our ‘work hard, play-harder’ mantra landed FORM on the Washington Business Journal’s Best Places to Work list and has led to the development of various annual events that include family, friends, and clients. It is hard to pick a favorite event, but one thing our team can agree on is that Judy and Angela know how to throw a party! Outside of the office, our community outreach program, Warm with FORM, has aided more than 25 local organizations that benefit causes important to our industry, clients, and individual employees. Similar to our project approach, regardless of whether we are running in a charity 5K or making sandwiches for the homeless, we work as one team, always focused on people. FORM’s first address was the basement of Rob’s house. Moving out of the basement, Mike and Rob signed a lease at 3333 K Street. FORM completed more than 100 projects in 2005, tripling the number from the year before. MinJae joined FORM in 2006 and is currently our longest tenured employee! Judy completed her first year at FORM in 2007 as FORM’s first-ever non-billable employee. With the help of Jim, FORM renovated its office in 2008 to accommodate its growing team. Laurent and his teammate Adam “ham and egged it” to the number one spot during FORM’s first ever FORM Open in 2009. With the help of Tribe in 2010, FORM spruced up their brand identity. 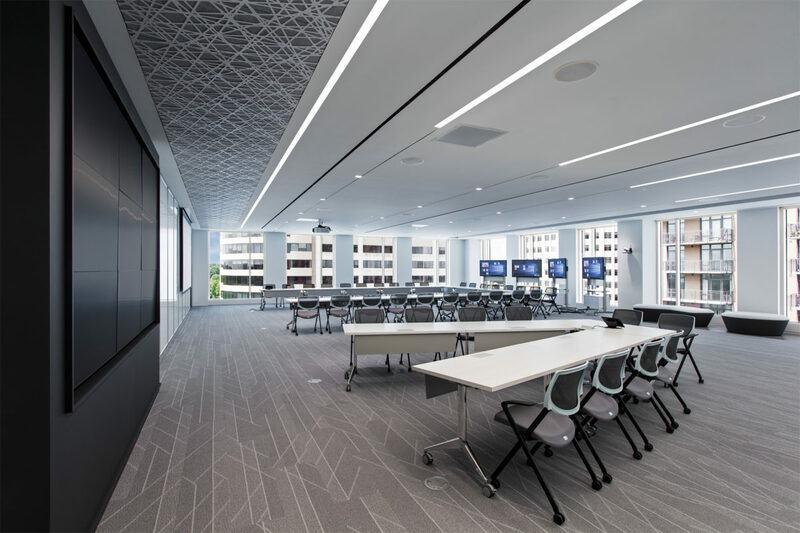 Thanks to Adrian’s help, FORM completed its largest project since inception; a 100,000+ SF space in D.C. In 2012 FORM won back-to-back NAIOP awards for the first time! In 2013 FORM helped GPI design their new office space which earned LEED Platinum certification. FORM laid the groundwork for Building Information Modeling in 2014 by transitioning from AutoCAD to Revit. 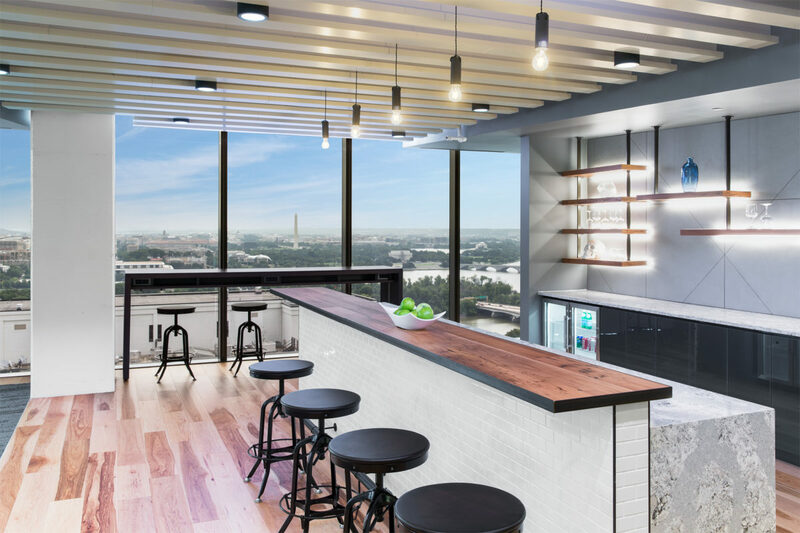 Attracted to its energy, FORM packed up the Georgetown office and moved across the river to Rosslyn in 2015. FORM made the Washington Business Journal’s Best Places to Work List in 2016. In 2017 FORM hired its 51st employee, Leigh! People have always been at the heart of our brand. In 2018 FORM launched Warm with FORM, a philanthropic effort that supports our local community by promoting a feeling of “warmth” all year long. "I find inspiration for my designs in textures." "My inspiration comes from creating ever-evolving designs." “I draw inspiration from creating people-centered designs." "I'm inspired by solving problems. I like to face challenges head-on and find creative solutions." "I'm inspired by the intricacy in historical architecture." "My design inspiration comes from thinking through the details to make sure all aspects of the design are accurate and feasible." "The great outdoors is where I find my inspiration." "I find inspiration in viewing the world - life experiences, travels, and other cultures - through an architecture lens." "I find design inspiration in my travels, seeing the way in which people interact with different places and take in the world around us." "I find design inspiration in patterns and geometry." "My inspiration comes from life itself. Designs are ever-evolving, and I continue to learn from new experiences as I take in a world of inspiration." "I'm inspired to be an unimpeded conduit to thoughtfully executing the functional needs of my clients." "I'm inspired by my everyday surroundings and how I can do something different to push the design industry to the next level." "I’m inspired by the art of brevity, marrying contrasts (especially old and new), and seeing people in their element." We view offices as blank design canvases. They are opportunities to visually explore your company’s brand and tell your unique story. Like our clients, no two designs are the same. Our first step is listening. And falling out of your chair with excitement (here’s looking at you, Rob) means we’re just getting started. Details gleaned during our initial conversations with you are implemented into our award-winning FORMWORK process which formulates the desired design and shape of your space through research and visioning. Projects are principal lead and receive the same team start-to-finish which ensures a seamless design experience. Our “round table” structure means that your project will also benefit from the collective experience of the entire firm. Within our studio of interiors-focused architects and designers, project knowledge is shared; ideas are developed, traded, critiqued, and refined. We believe this leads to radical solutions that set our designs apart. 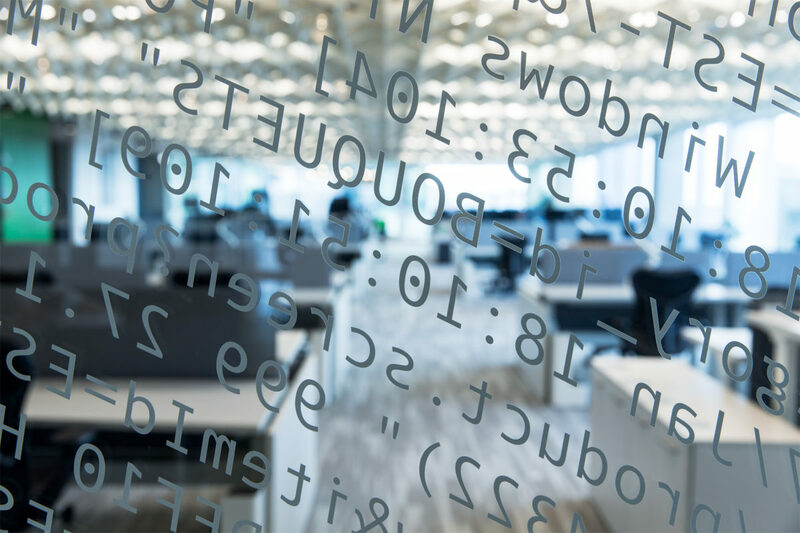 In Accenture’s previous space, the four groups that make up the cyber practice were separated. The division of these groups left them disjointed and unable to collaborate on creating customized integrated solutions for their clients. 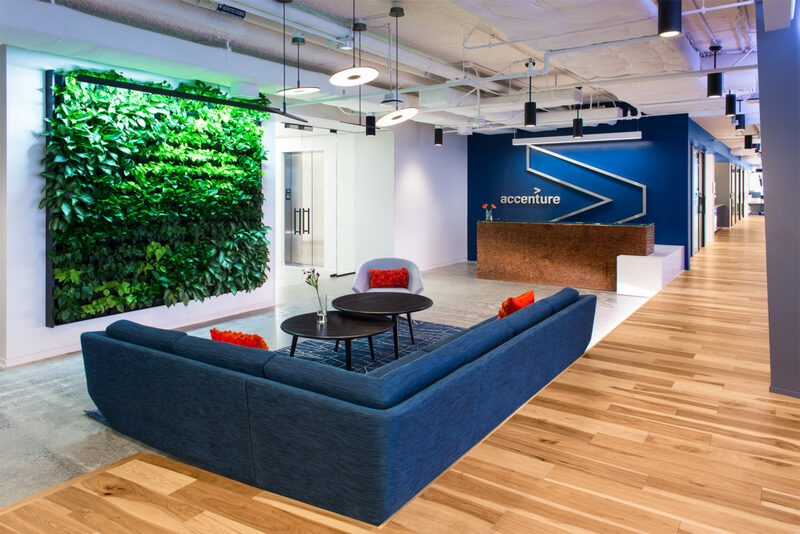 To address Accenture’s concerns, the design team created a state-of-the-art Client Demo space in Accenture’s new building. 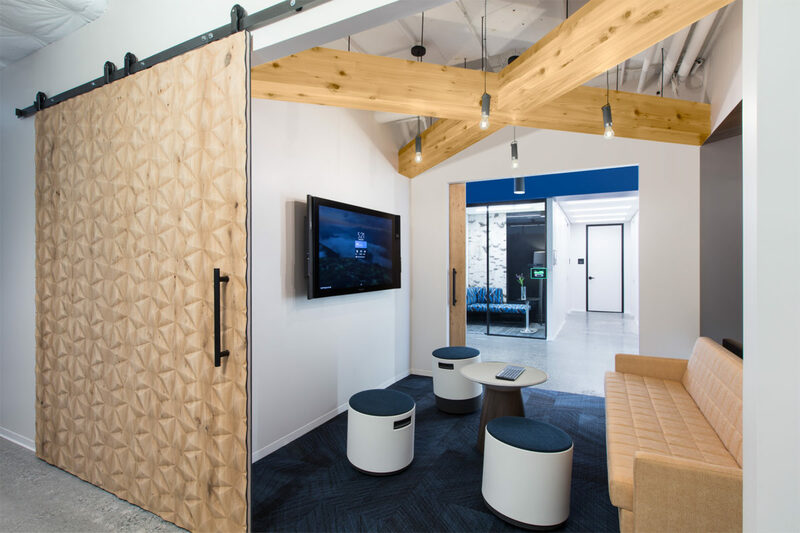 The Client Demo space makes up the central hub of the space and brings clients and employees together. The design is very flexible, allowing the space to be configured in multiple layouts and working styles depending on the event. 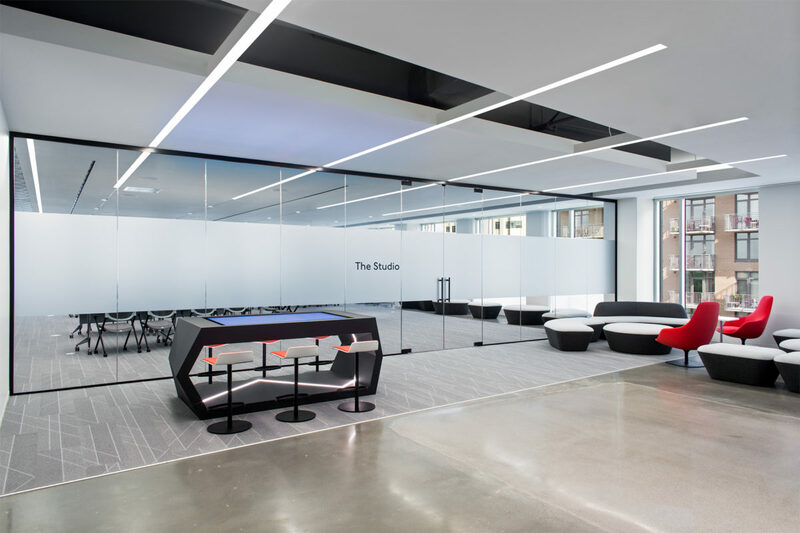 The versatility of the design allows Accenture to show off their talent and show their clients what customized integrated solutions they can create. In addition to the main demo area, the space has a defined path through it, uniting teams and clients through collaboration points. 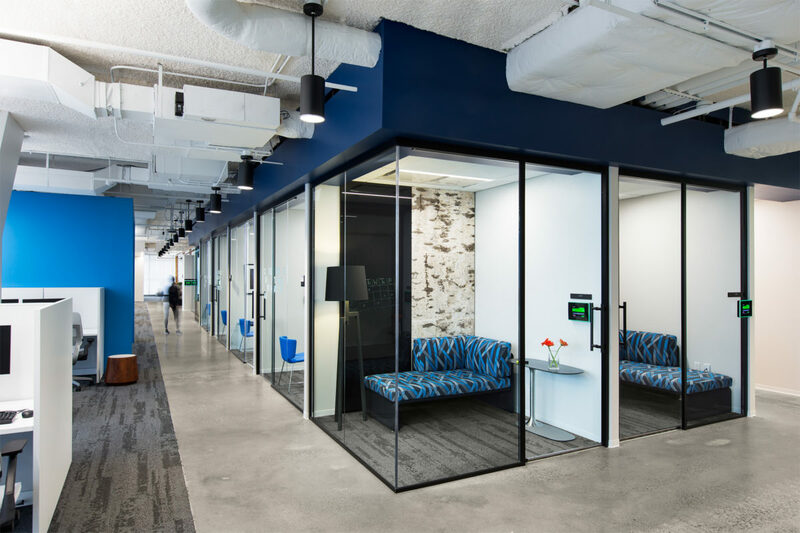 These collaboration areas are collocated within employee workspaces and between them to foster cross-pollination and teaming. Each area is equipped with technology allowing teams to interact and design solutions on the fly. Respite rooms are also scattered throughout the space to give employees the option to perform focus work in preparation or after collaboration occurs. 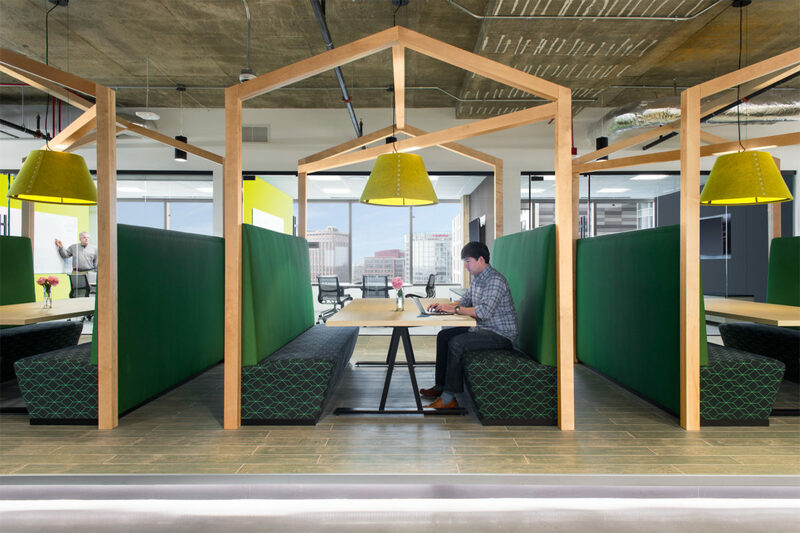 Each team has their designated workspace on the floor, where they were able to weigh in on the design and brand elements, giving individuality and team personality to their space. In conjunction with the Accenture brand consultant, we were able to overlay Accenture’s overall mission and brand throughout the space, thereby uniting these unique teams under one overall identity. 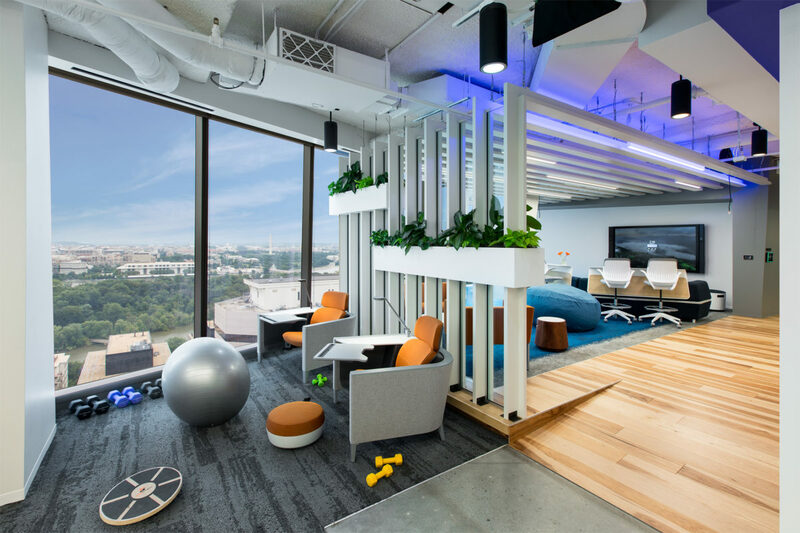 It was determined early in the design process that the innovation center would require two very different spaces; the work area, a distraction-free space that would cater to CGI Federal’s creative IT employees, and the demonstration space, a bright polished area that would support collaboration with clients. To portray the collocation of the demonstration space and the work area through design, the project team enlisted two dominant gestures to define and connect these two opposing areas, Inspiration (the process) and Realization (the solutions). Designers visually defined ‘Inspiration’ with an open ceiling and vertical pendant lights. 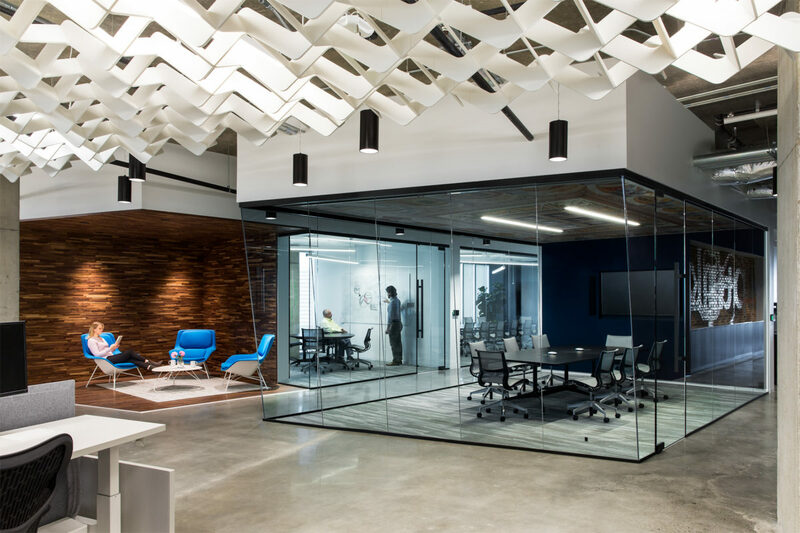 The exposed ceiling elements show how the building works while also defining the designated working area for employees. 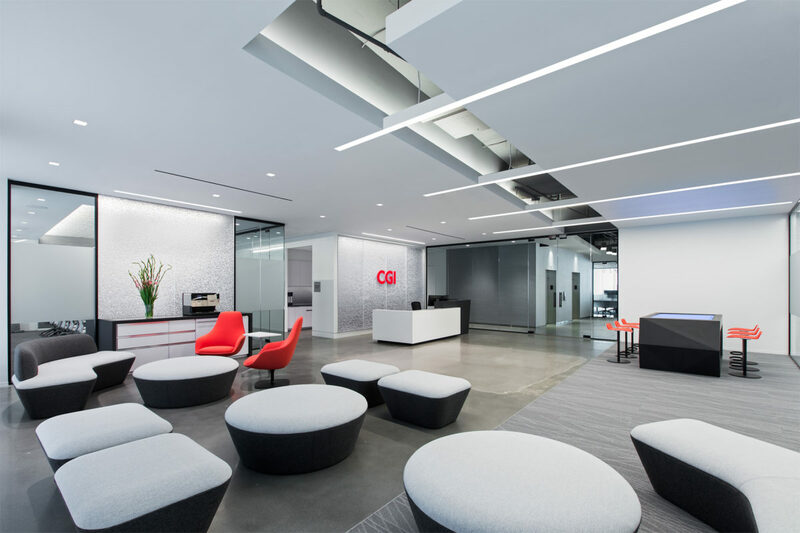 Slivers of these raw inner workings stretch through the lobby, client experience area, and demonstration space via a reveal thus representing the inspiration and work that goes into CGI Federal’s sophisticated, final products. 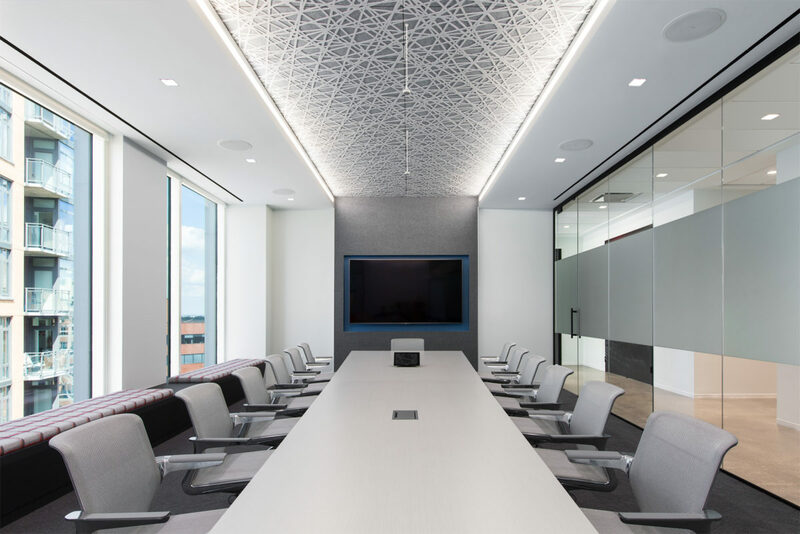 In areas where the acoustics were a concern, designers prescribed a custom perforated metal grid system that integrates acoustical fabric for sound absorption. ‘Realization’ is the result of ‘Inspiration.’ In contrast to the open ceiling in the ‘Inspiration’ areas, a closed ceiling and continuous horizontal lighting elements define ‘Realization.’ Immersive video walls, touch tables, and interactive kiosks are spread throughout these spaces, encouraging employees and guests to explore CGI Federal’s technologies in new ways while supporting innovation in action. Splunk aimed to create a work setting that would break the traditional 9-to-5 office. They envisioned a design that would highlight their playful personality while maintaining their reputation as a leader in the IT field. 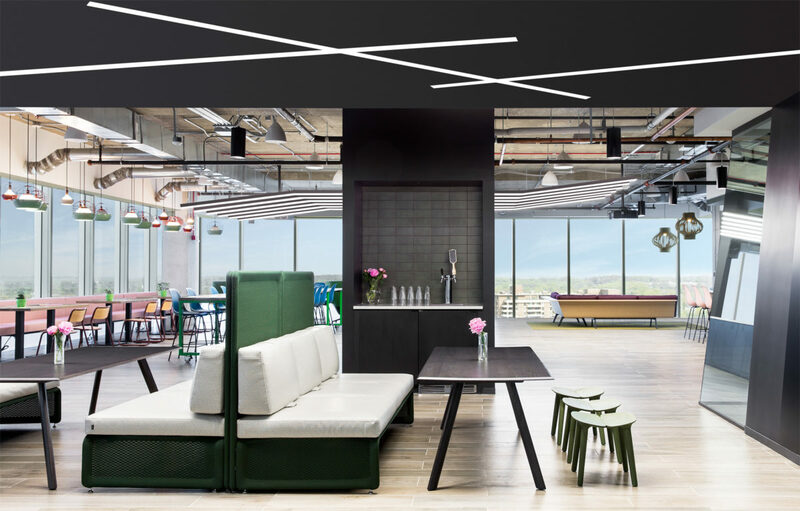 In today’s workplace, it is not uncommon for employers to place emphasis on company culture through their office design, but Splunk’s goal for their space moved beyond your standard break areas and focused on providing a balance that would truly blur the line between work and play. 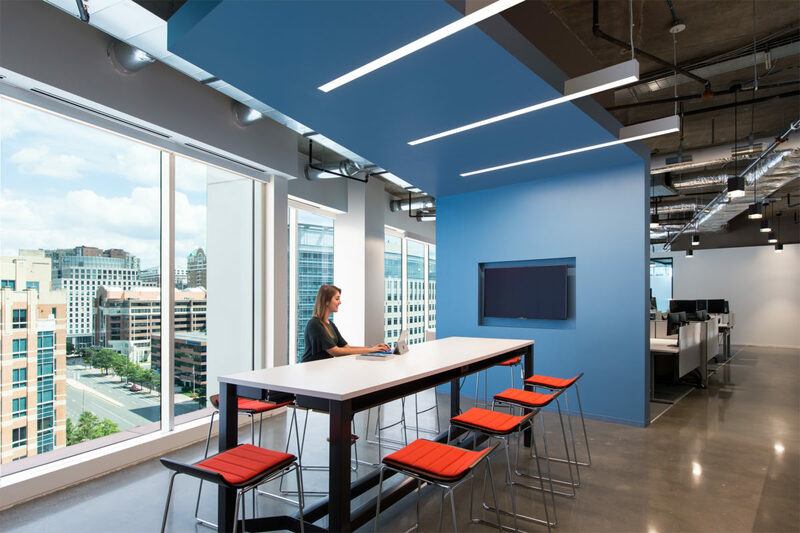 The admirable eccentricities of this company are conveyed through thoughtful space planning, finish selection, vibrant color application, and custom graphics. 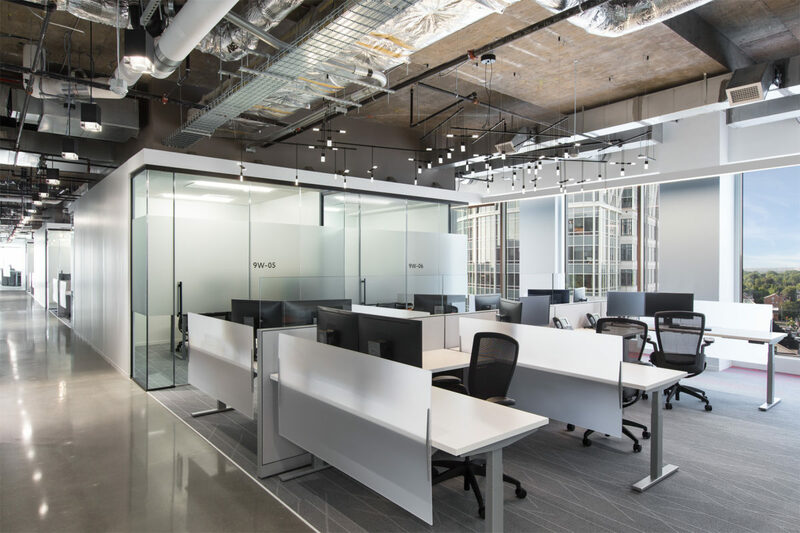 Workspaces are sewn together with reading nooks and soft seating, conference rooms are adjacent to lounge areas, and sustainable design elements bring the outside in providing employees with mental benefits and increased productivity. 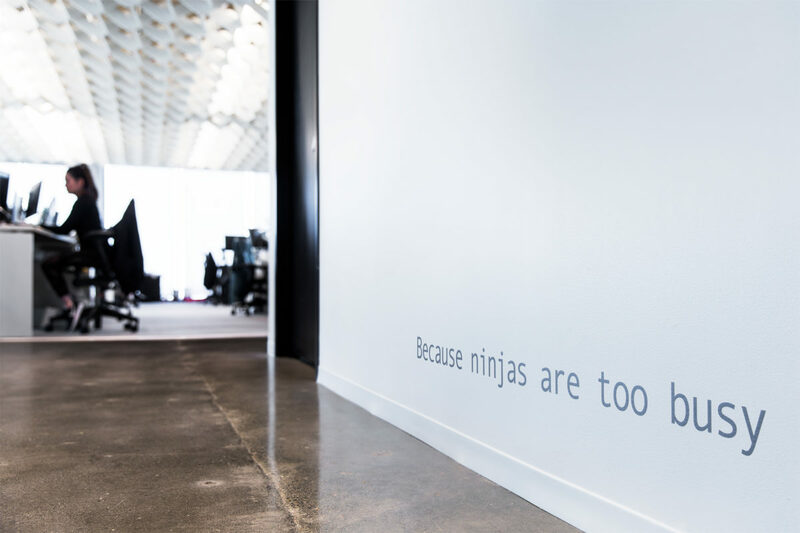 In creating a space for this passionate group of innovators and problem solvers, it was important for this office to speak their language while creating its own unique identity in the DC market. 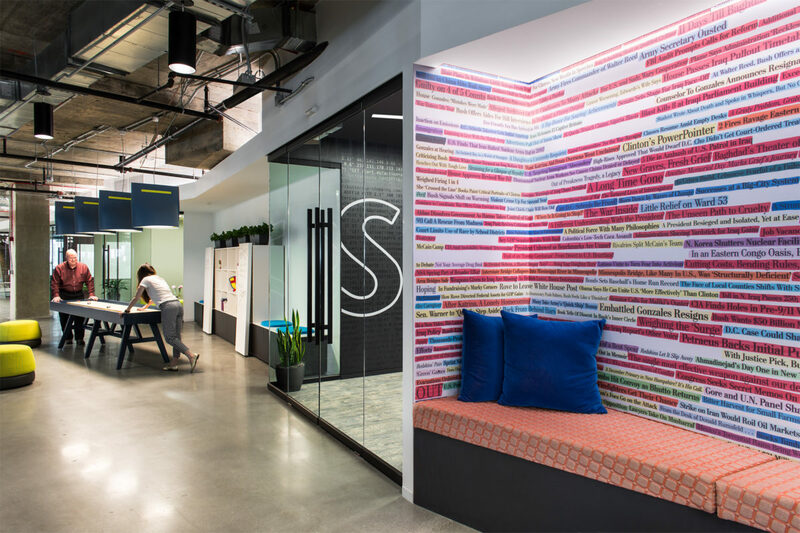 To that effect, designers strategically bookmarked the space with Splunk’s signature brick, a material that can be found in every location across the globe. In one instance, designers used the brick as a backdrop for imagery of a DC metro map. 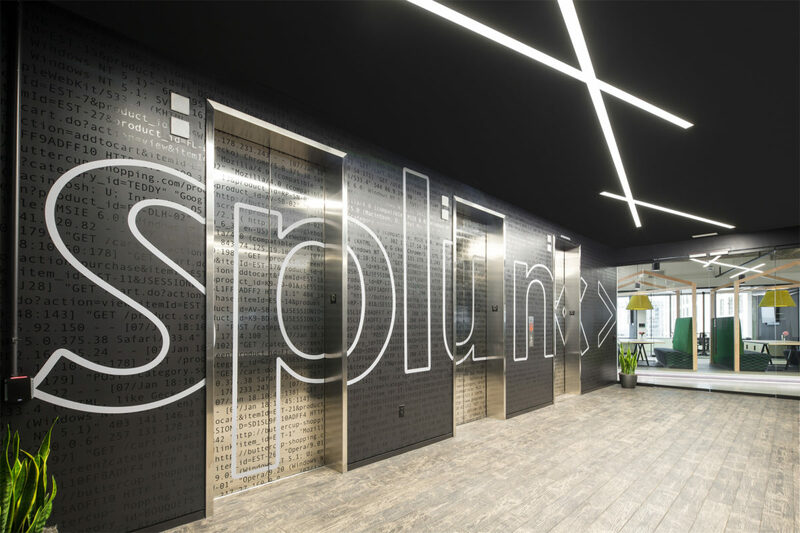 With their logo superimposed onto the elevator doors in their lobby and a custom sign spelling out their name in lights, there is no mistaking the identity behind this space. 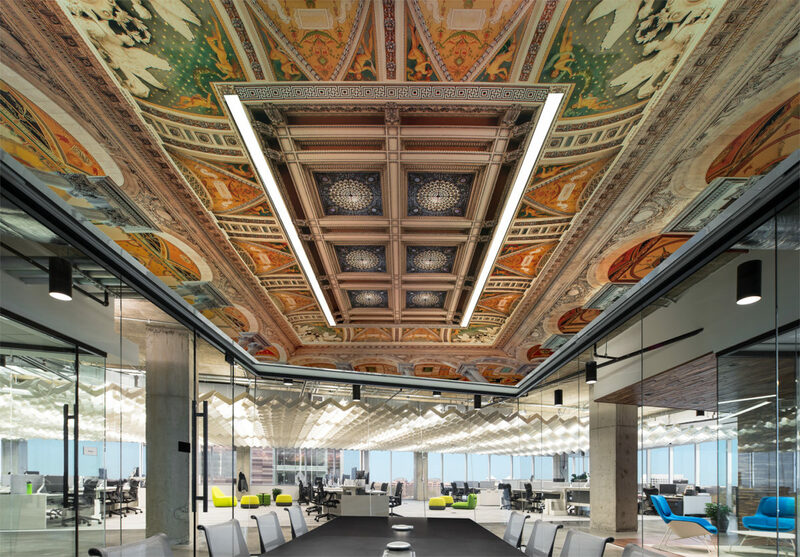 To further embrace the locality of this office, designers replicated the Library of Congress’ intricate ceiling in a glass-encased conference room and transformed headlines from the Washington Post newspaper into a vibrantly colored, graphic wallpaper. 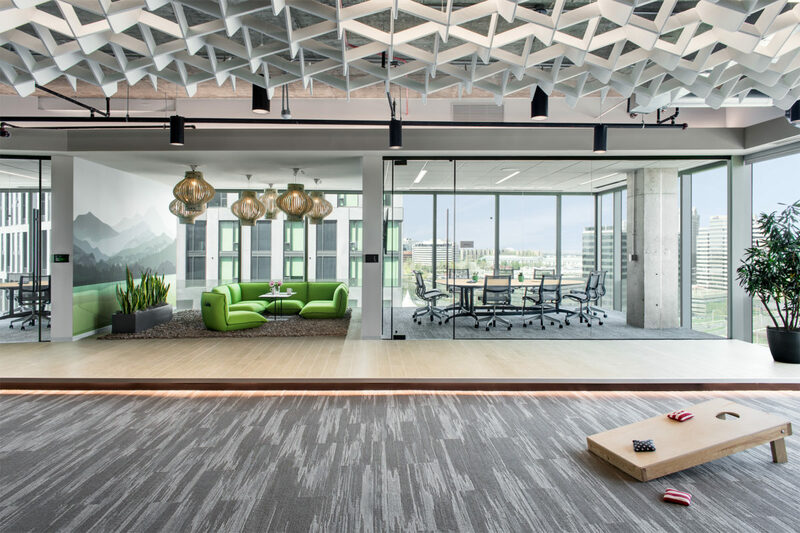 While more focal design details make this an impressive space, it’s the hidden branding elements that make this workspace feel like home to any Splunk employee. Signature company catch phrases surprise you in the most unexpected places and provide a unique sense of community; like the feeling you get when you are part of an inside joke. 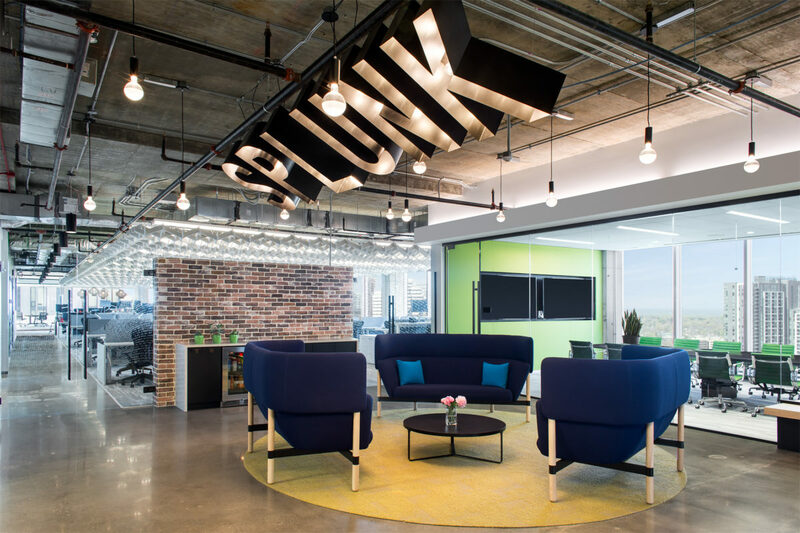 Splunk’s office was designed for the end user but attracts guests and visitors alike, providing them with instant insight into the personality of this IT company. 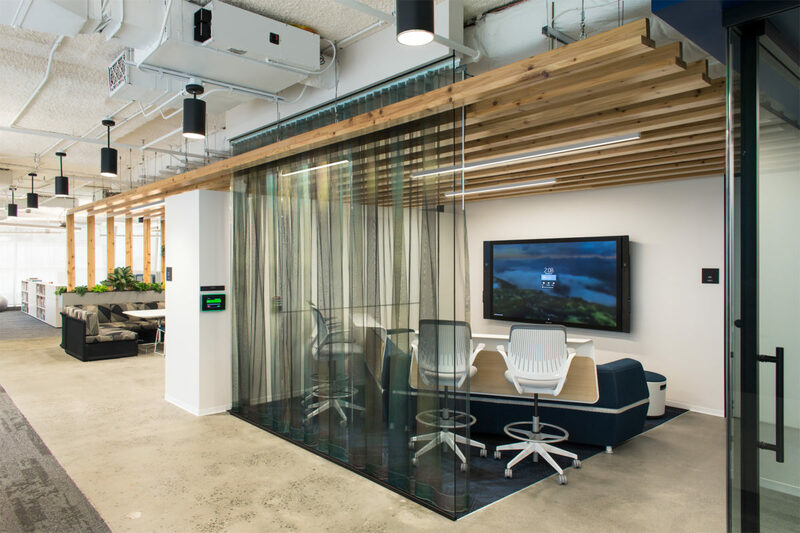 Whether you are visiting for the first time, coming from another Splunk office, or find yourself in the space 5 days/week, you will instantly feel immersed in the culture and quickly feel inspired to adopt it as your own.